Hooked to an Iveco Stralis test truck (read the review here) was the latest evolution of Freighter’s EziLiner curtain-sider, equipped with a number of innovative features progressively released over the last year or so. For the record, the demonstration trailer stood 4.3m tall, 13.73m long and, according to Freighter, had an estimated tare weight of 7,871kg. 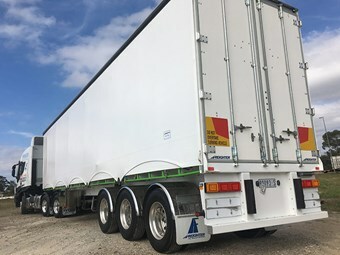 Described as one of Freighter’s most successful developments over the past decade and winner of an Australian Design Award in 2008, EziLiner is protected by patents that make it a uniquely Freighter design for both trailer and rigid body configurations. As Freighter explains, EziLiner uses a pneumatically actuated arm that hooks to a high-tensile cable running through a series of arcs at the bottom of the curtain to automatically create vertical tension. In effect, it replaces the 22 buckles on each side of a standard curtain-sided trailer, allowing an entire curtain to be quickly and safely fastened or released at the flick of a single lever at the front of the trailer. Freighter released its sliding post load restraint gates. Fitted to the demo trailer, the new gate system is rated to hold pallets with a loaded weight up to 1,300kg and, critically, combats the weight and difficulty of using traditional gates. Safety is dramatically improved, with Freighter stating: "Using two hands, one on the mechanism and the other on the horizontal gate beam, the gate is opened with two simple movements. "The gates are virtually weightless thanks to the spring assisted design (and) by removing the weight in the gate there is almost no risk of back, arm or shoulder injuries, or gates falling on operators." Freighter further explains that the gates can be easily stacked neatly out of the way at the front or rear of the trailer and are built with three different length tabs to make it easy to put the gates back into position. The system can be also tailored to individual requirements with vertical or horizontal bars and varying gate heights. Furthermore, Freighter says its redesigned curtain rollers reduce the effort of opening and closing curtains by 50 per cent. Another significant development on the demo trailer was Freighter’s two-piece roof rail, which allows a curtain rail to be easily replaced if damaged by a forklift or the like. "Traditionally, replacing the rail has meant cutting the entire roof off and replacing the complete roof assembly. "Now, with the two-piece roof rail, the curtain rail and roof form two components, meaning the curtain rail alone can be easily replaced by popping out the rivets and riveting in a new rail." The result is a repair that saves time and money, and puts the trailer back on the road sooner.